The other day, I was browsing through my emails and saw one that totally caught my eye. It was from My Blog Spark and they wanted to know if I would be interested in hosting a review/giveaway from P&G through MyBlogSpark. Of course I said YES! Then I promptly forgot about it. Gift card for $15.00 to offer as a giveaway. Wow, Wow, WOW! I danced the happy dance as I unpacked everything and you'd have thought that Christmas had come again. I absolutely love it when I forget about hosting a review/giveaway and then the box shows up! Okay, so, the instructions called for me to make the cobbler (which was FANTASTIC, by the way...if you want the recipe, email me! ), and instead of popping the dish into the dishwasher, which I normally do with the after-supper dishes, I took the 24-hour challenge and left it sitting on the counter -- the empty, crusty, messy, purple-stained baking dish -- overnight -- without rinsing -- then washing it the next evening, after dinner, with the Cascade Complete. Believe me, it was hard looking at that dirty, stained dish...at one point, I thought about shoving it in the oven so I wouldn't have to look at it, but then I figured I'd forget about it, so, that idea went out the window! 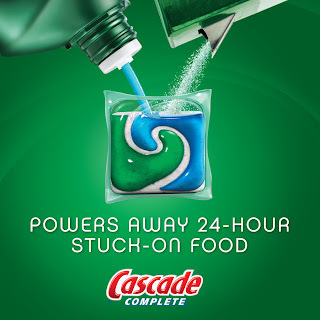 As soon as the 24 hours were up, I put that dirty dish in the dishwasher, popped one of those Cascade Complete All-in-1 ActionPacs in the detergent slot and waited for it to wash. I am happy to report that the dish came out sparkling clean with no streaks!! I am hooked!!! Those little ActionPacs are amazing!!!! That's my honest review of the product. Was I happy with the results? Yeppers! Would I recommend this product to my family and friends? You Bet! 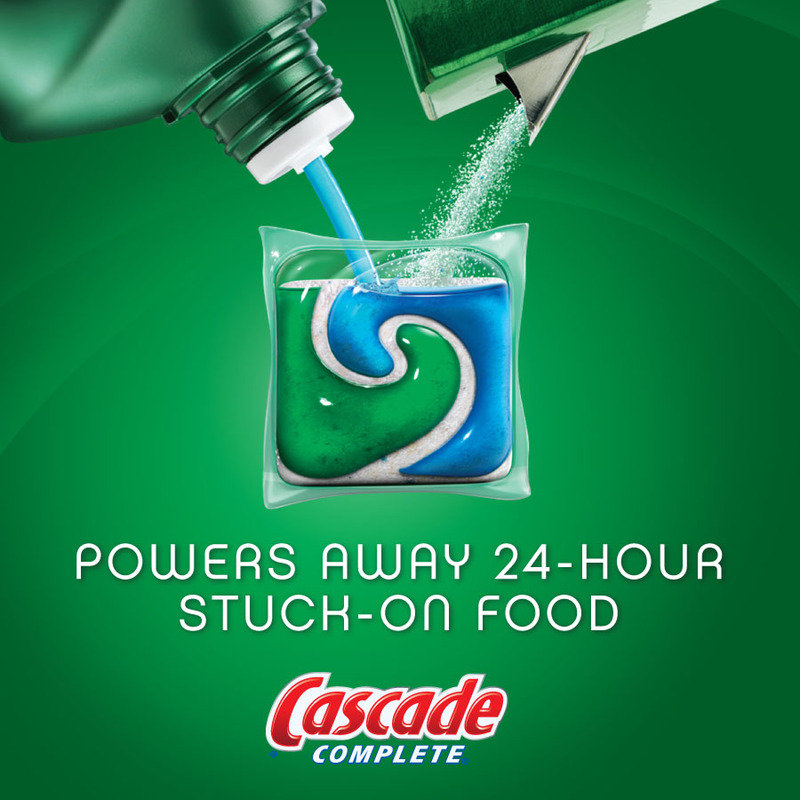 Share the meal that you are most excited to use the Cascade Complete All-in-1 Action Pacs to clean up after. 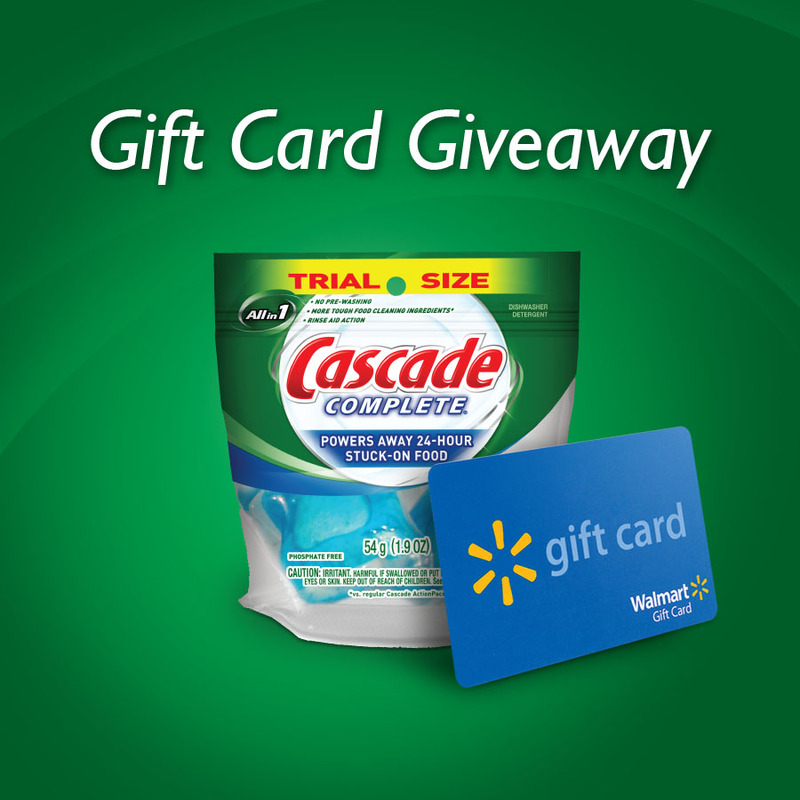 There are going to be SIX Winners with this giveaway: FIVE of you will win Cascade Complete All-in-1 ActionPacs and ONE of you will win the BIG PRIZE: A $15.00 WalMart Gift Card! Woo-Hoo!! 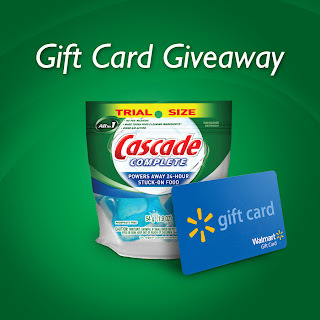 Full disclosure: P&G provided me with the Cascade Complete All-in-1 ActionPac Kit, information, Six (6) trial packs and a $15 Walmart gift card to giveaway through MyBlogSpark. All thoughts and opinions on the products provided are strictly my own. This giveaway will run through Tuesday, May 10, 2011 11:59 PM CST. I will then choose SIX winners by using random.org, with the 6th and final number winning the $15.00 WalMart gift card. Winners will then be notified by email and will have 48 hours to reply with their shipping address. Those who do not respond after 48 hours will not longer be an eligible winner, and I will then choose a new winner. Good Luck, and I cannot wait to get lots and lots of entries!! Spaghetti can get messy and the Cascade Action Pacs would be great to clean those pots and dishes. I follow My Money Mission Online in GFC. I would love to try after making Blackberry Cobbler, it's messy. Been a follower of MMM online as well. Yum! Bllueberry cobbler!! What a great food to teat dish detergent on. I am following you on NetworkedBlogs! I am following you on this blog. I am also following you on your other blog. I am totally following you on Facebook. This is exciting. Cascade is my favorite brand, but I do not always buy it because I can get Finish so inexpensively (or free) with coupons. If I win the GC, I will be happy to use it for a yummy steak...and some Cascade to clean the grease? LOL. I'd like to try it on enchilada pans. I am most excited to try on my dear hubby's fried chicken! Yikes! Did I win yet? LOL. I would like to see how these clean up cheesy potatoes! i will gladly use the cascade on my tapioca pan. for some reason i burn it every time and bits get stuck. you'd think by now i'd know i need to watch it the whole time. I liked you on Facebook. is that the same as follow?